PROFESSOR RICHARD T. ELY WAS AN ANARCHIST. Ely was a socialist, an author of “utopian, impracticable and pernicious doctrines.” He was a pro-union rabblerouser who preferred “dirty, dissipated, unmarried, unreliable and unskilled” workers. He was a threat to the American way of life. So you might believe if you read the scathing charges leveled against the University of Wisconsin economics professor in a national magazine by the outspoken Wisconsin superintendent of public instruction. Professor Ely stood accused in 1894. 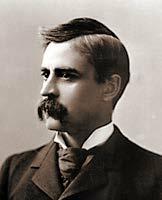 The clash between Ely and school teacher Oliver E. Wells in 1894 led to a highly publicized trial. The professor was eventually cleared, but what was remembered for generations was the statement issued by the Board of Regents after the trial — words so powerful and timeless they were cast into bronze. 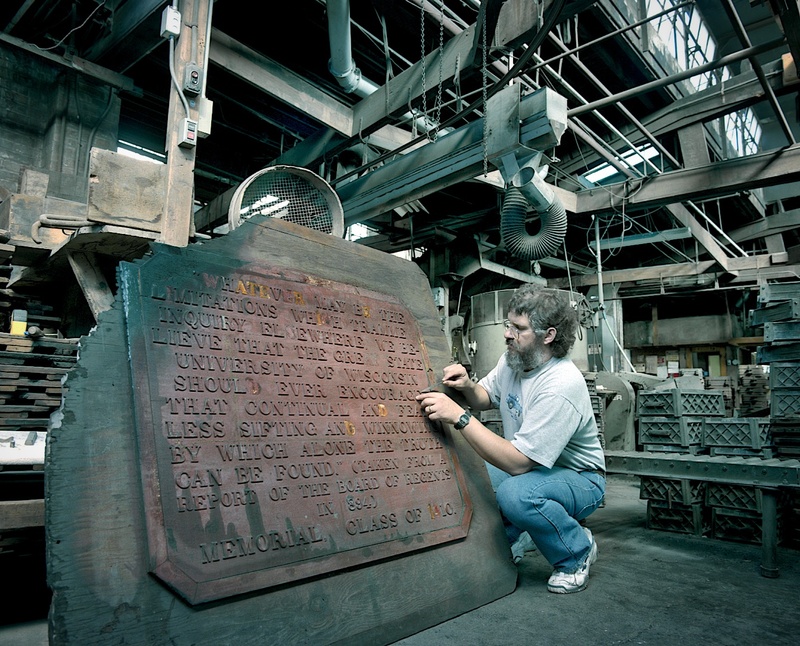 Those words became more important for the University of Wisconsin-Parkside in 1998, when two duplicates of the famed plaques were freed from a 25-year dormancy in the basement archives, restored and prepared for installation on campus (see related story). 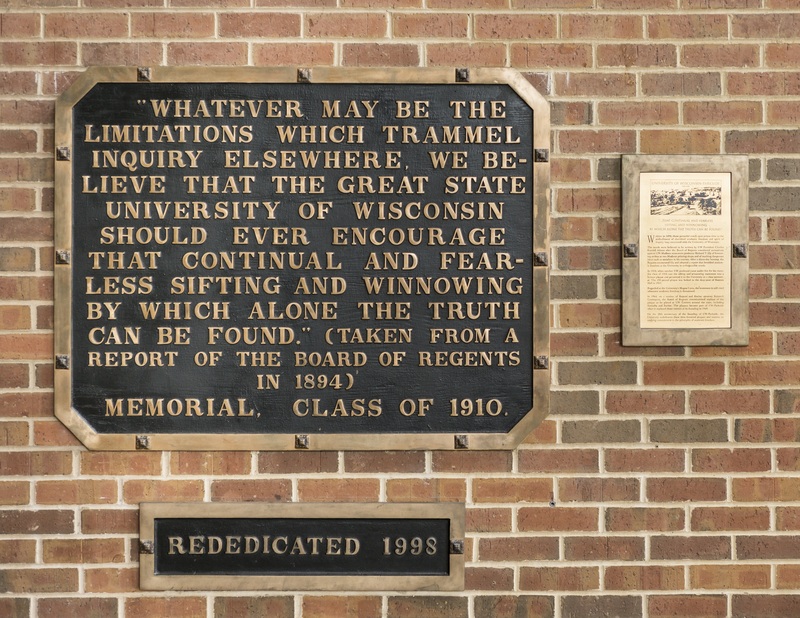 The plaques are symbols not only linking the university to a proud tradition, but also a modern beacon defending the creation of knowledge that is at the heart of University of Wisconsin education. The Oliver Wells letter set off a firestorm of controversy. “The principles of academic freedom have never found expression in language so beautiful, words so impressive, phrases so inspiring,” said UW President Charles Van Hise at the plaque’s dedication in June 1915. Theodore Herfurth, a member of the class of 1894 who later wrote a definitive history of the Sifting and Winnowing story, said the memorial plaque “stands as a sentinel” to guard the spirit of the university. “When time and the elements shall have effaced every resistive letter on the historic bronze tablet, its imperishable spirit shall still ring clear and true,” Herfurth wrote in 1948, just two years before his death. The Sifting and Winnowing story still rings across time. In December 1964, it was the subject of the short-lived Profiles in Courage television series, starring Daniel O’Herlihy as Ely and Edward Asner as Wells. 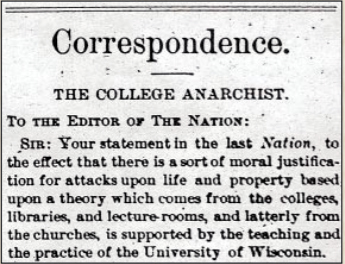 Ely probably couldn’t have imagined such an outcome when Wells, a teacher and former superintendent of schools in Waupaca County, attacked him in a 535-word letter to the editor of The Nation titled “The College Anarchist,” published in the July 12, 1894 issue. 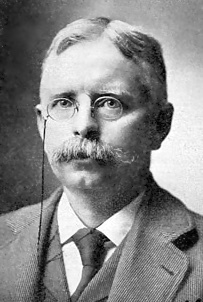 In his role as Wisconsin superintendent of public instruction (1891-95), Wells was an ex-officio member of the Board of Regents. Oliver Wells leveled scandalous accusations at Professor Ely. Ely, a distinguished political economist, had among his concerns the welfare of the working class and organized labor. He interacted with the labor movement, and wrote about socialism in his textbooks. 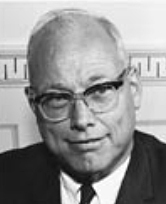 A founder of the American Economic Association and the Christian Social Union, Ely helped develop the reform ideology that was central to the Progressive movement in America. The embarrassing national publicity that followed forced the Board of Regents to appoint a three-member trial panel to investigate Ely. 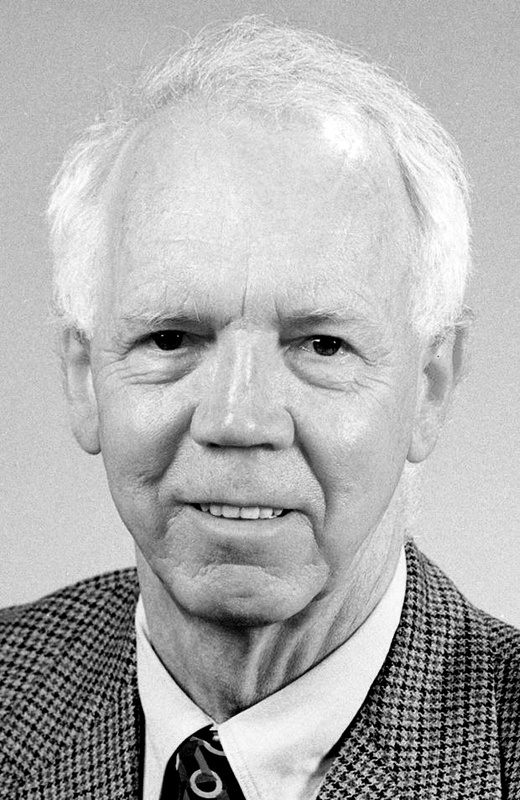 The inquiry was chaired by Herbert W. Chynoweth, former Wisconsin assistant attorney general and a prominent Madison attorney. Other panel members included Dr. Harvey B. Dale, former four-term mayor of Oshkosh, and Milwaukee banker John Johnston. During a three-day hearing that began Aug. 20, 1894, Wells’ accusations began to unravel as exaggerations, half-truths and misrepresentation. Chynoweth made a key ruling on the second day of the hearing that the panel would not examine all of Ely’s writings, but would focus on specific allegations in Wells’ letter to The Nation. Regent Herbert W. Chynoweth of Madison chaired the Ely inquiry panel. Testimony showed that Ely did not coerce or direct strikers, boycott non-union shops or promote anarchy. In fact, Ely was hailed as one of America’s foremost minds on political economy. He voiced support for unionization of printing company employees, but was not involved in the ongoing labor disputes. UW President Charles Kendall Adams found no basis for the charges. As the hearing entered its third day, Wells admitted that he could not prove his accusations. At this point, the panel dropped from trial mode into that of a fact-finder. Ely’s exoneration was secured. The panel’s report, issued to the Board of Regents on Sept. 18, 1894, went beyond exoneration. Regents unanimously adopted the document and its poetic language, sending a signal through the ages of its commitment to freedom of inquiry. “We feel that we would unworthy of the position we hold if we did not believe in progress in all departments of knowledge,” read the report, believed to be written by UW President Adams. “In all lines of academic investigation, it is of the utmost importance that the investigator should be absolutely free to follow the indications of truth wherever they may lead.” There was later ongoing debate as to who coined the “Sifting and Winnowing” phrase. In June 1942, an aged Professor Ely insisted the credit belonged to Alfred T. Rogers, the son-in-law of Regent Chynoweth. While the poetic words made a memorable statement, they were not resurrected for nearly 20 years when yet another UW professor stood accused of impropriety. Sociology professor Edward Alsworth Ross was implicated for allegedly consorting with anarchist Emma Goldman and giving a speaking platform to sexual liberation proponent Parker Sercombe, a man said to promote immorality. Accusations against Professor E.A. 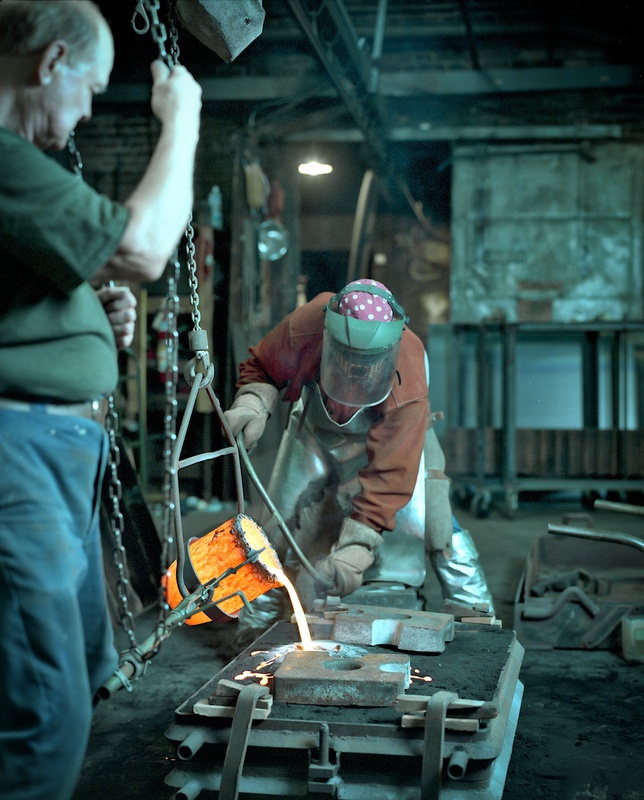 Ross led to the casting of the plaque in 1910. Regents were so incensed with the 1910 allegations against Ross that they approved a statement of censure. Suggestions were made that Ross be fired. UW President Van Hise led a vigorous defense of Ross against what again proved to be somewhat dubious allegations. Regents did not take action against Ross. The professor never attended Goldman’s talk in Madison, but when she paid a visit to his office, he gave her a tour of campus. “Promptly the newspapers shrieked that I was an anarchist,” Ross said. Van Hise privately told Ross that his real indiscretion was publishing Sin and Society: An Analysis of Latter-Day Iniquity. Some on the Board of Regents sought a pretext to oust Ross because of the book, Van Hise said. 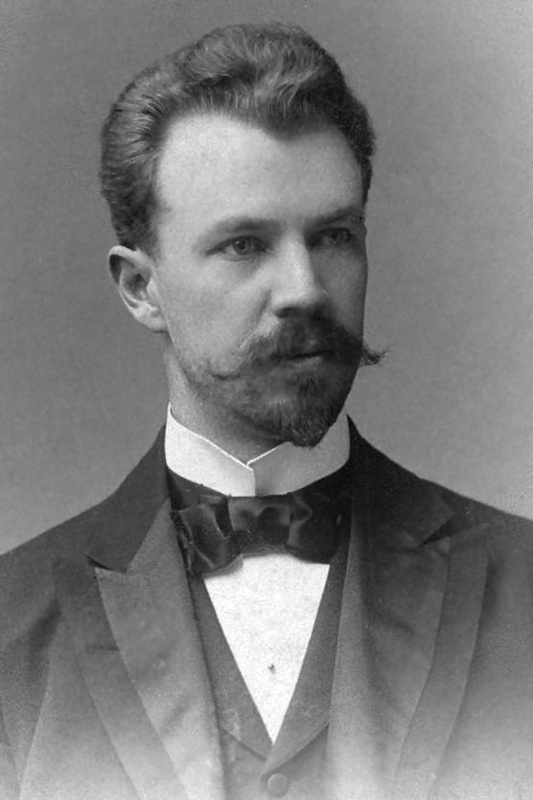 Journalist Lincoln Steffens suggested casting the “Sifting and Winnowing” statement into a plaque. Using scrap plywood and pattern maker’s letters, student Hugo H. Hering created the somewhat crude plaque pattern and had it cast at Madison Brass Works Inc. foundry for $25. 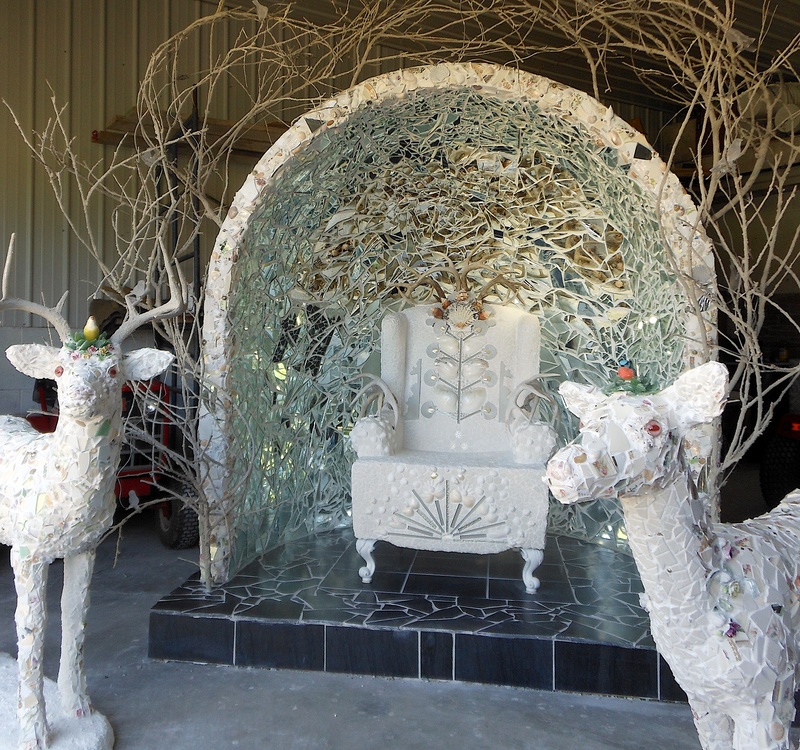 “It was purely a hand-made job,” Hering said, “in which I used a three-ply wood veneer panel as a background. 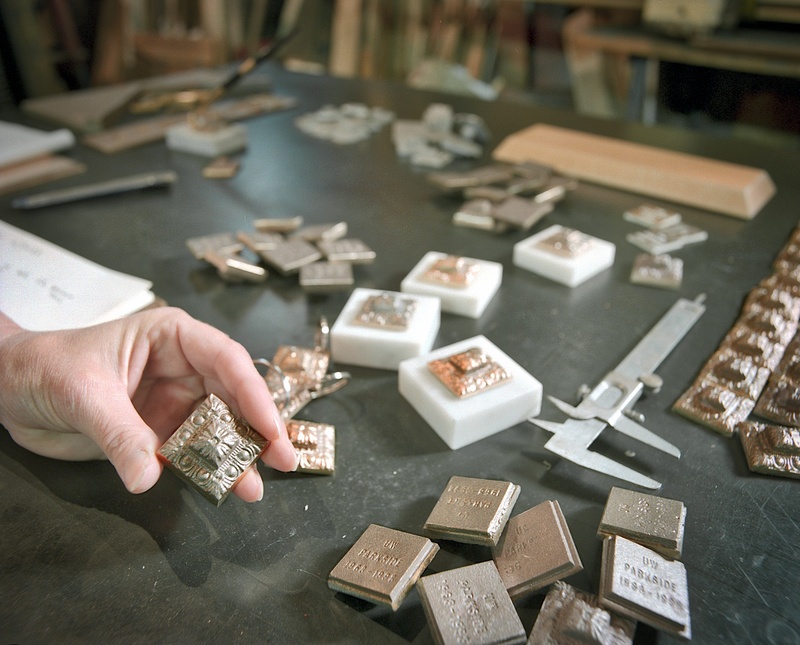 I bought white metal letters, such as used by Pattern Makers, and fastened these letters to the veneer back.” Hering carted the form to Madison Brass and Henry Vogts cast the tablet for the students. There was a public perception that the students were trying to dictate to the Regents. Indeed, student leaders had plans to erect the bronze tablet themselves near campus if Regents rejected it. Class President Francis Ryan Duffy petitioned the Board of Regents to place the plaque at any “suitable” campus location. Publicly, Regents said rejection of the tablet came from not wanting to set a precedent that could “mutilate” the facades of university buildings. According to the account by Herfurth, however, the real reason was they despised Lincoln Steffens. Student Francis Ryan Duffy petitioned the Regents to accept the plaque in 1910. Hugo H. Hering was chairman of the memorial committee and designed the plaque. After the kerfuffle, the plaque, as one newspaper put it, came to repose “in a dry goods box in the basement of the administration building.” Regents formally accepted the tablet in April 1912, but had no plans to affix it to a building. It wasn’t until 1915 when tempers had cooled (and the makeup of the Board of Regents had changed) that the plaque was rescued from storage, bolted to the door post of Bascom Hall and formally dedicated. 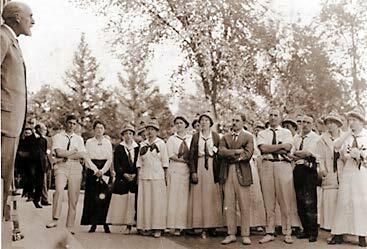 President Van Hise had to broker a solution between zealous Class of 1910 alumni and Regents who were still stung at the suggestion they had harmed academic freedom in 1910. INSPIRING WORDS: UW President Charles Van Hise speaks at the original plaque dedication in June 1915. 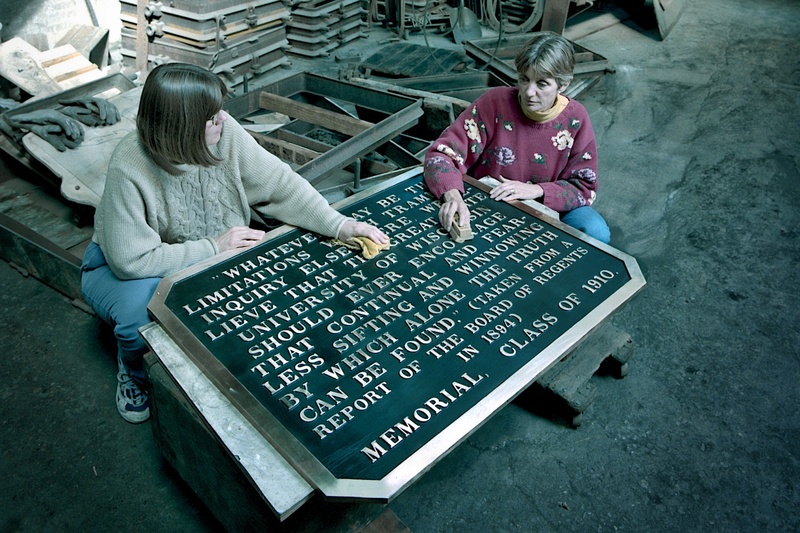 The plaque stood as a symbol of freedom for 41 years before pranksters removed it from its hallowed spot on Bascom Hall in 1956. Just as a fund was being established to recast it, police found the 255-pound plaque near a trail on campus. It was rededicated with great pomp and ceremony on February 15, 1957. 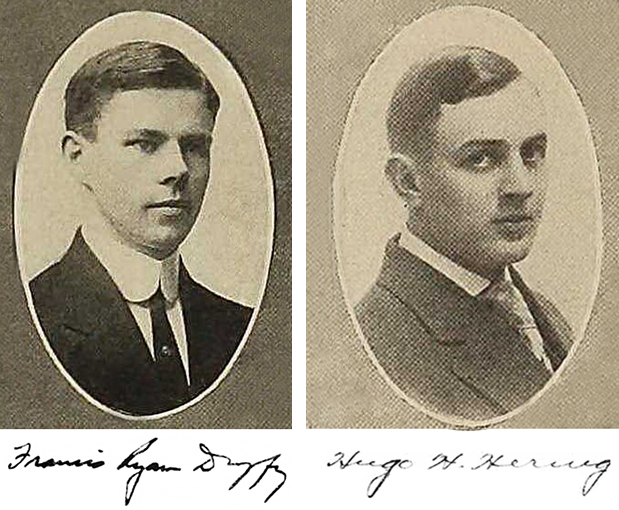 More than 325 members of the Class of 1910 were honored at the event, attended by Wisconsin Gov. Vernon Thompson and former Gov. Oscar Rennebohm. Duffy, now chief judge of the U.S. Court of Appeals in Chicago, was among the honored guests. Hering, who went on from his university days to become assistant Wisconsin state treasurer, died in 1946. Regent Kenneth L. Greenquist of Racine proposed creating duplicates of the Sifting and Winnowing plaque. In 1964, Racine attorney Kenneth Greenquist, a member of the Board of Regents, sponsored a resolution to create duplicates of the plaque for the UW Center campuses around the state. Plaques were installed at the Racine and Kenosha campuses in 1965 and 1966 on what is now Gateway Technical College’s Lake Building and Bradford High School in Kenosha. UW-Parkside took possession of the plaques at its founding in 1968, and thus began their long residence in storage. — A shorter version of this article appeared in the winter 1998-99 issue of Perspective magazine at the University of Wisconsin-Parkside. Special thanks to the UW-Madison Archives for research assistance, materials and photos used in preparation of this article. Richard T. Ely taught at the University of Wisconsin until 1925, when he left for Northwestern University. More than 70 years after his death, his writings continue to draw spirited debate. He died on October 4, 1943 in Connecticut. He was 89. He is buried at Forest Hill Cemetery in Madison. 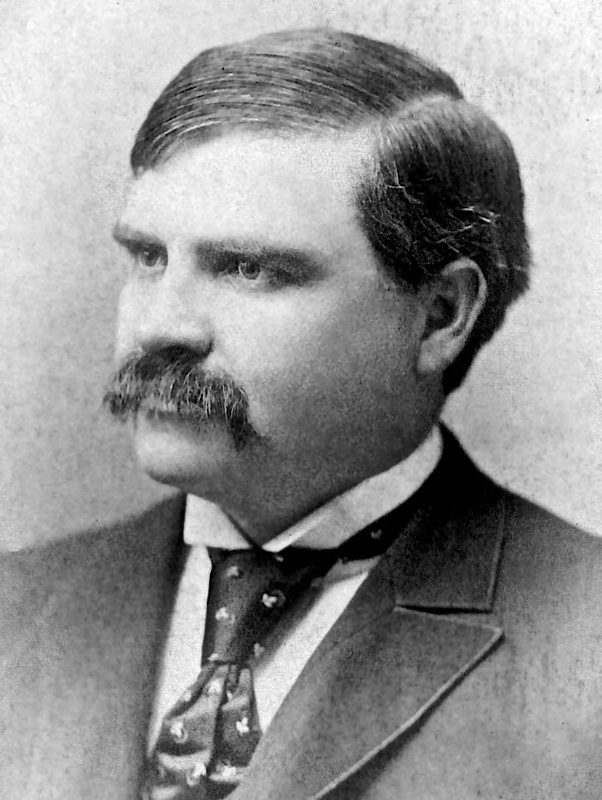 Oliver E. Wells served as Wisconsin superintendent of public instruction from 1891 to 1895. He was previously a teacher in Appleton and the superintendent of Waupaca County schools. In September 1899, he became principal of Wisconsin’s first teacher training school, located at Wausau. He served in that role until 1915. 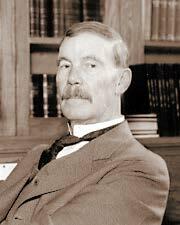 Wells died on December 26, 1922 at age 69. Charles Kendall Adams served as University of Wisconsin president from 1892 until 1901, when he resigned due to failing health. He was previously president of Cornell University from 1885 to 1892 and a professor at the University of Michigan. During the Civil War, he commanded Michigan’s Tappan Guards. He died on July 28, 1902 in Redlands, California. He was 67. Herbert W. Chynoweth was a chief lieutenant and legal adviser to Robert M. La Follette. He served as assistant Wisconsin attorney general and later conducted a longstanding legal practice in Madison. 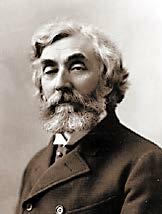 He died on October 14, 1906 from arterial sclerosis. He was 58. Charles R. Van Hise was the first University of Wisconsin alumnus to serve as is president. He was named successor to Charles Kendall Adams in 1903 and served until 1918. Under his leadership, the university sought to move beyond instruction to help improve the lives of everyone in the state. This led to the “Wisconsin Idea,” that the borders of the university are the borders of the state. Built in 1967, Van Hise Hall on the UW campus is named in his honor. Van Hise died on November 19, 1918 in Milwaukee. Francis Ryan Duffy was U.S. senator from Wisconsin from 1933-1939 and later a federal judge. 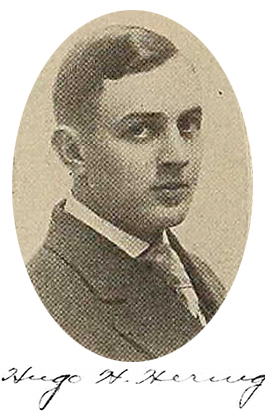 After graduating from the University of Wisconsin in 1910, Duffy earned his law degree at UW in 1912. 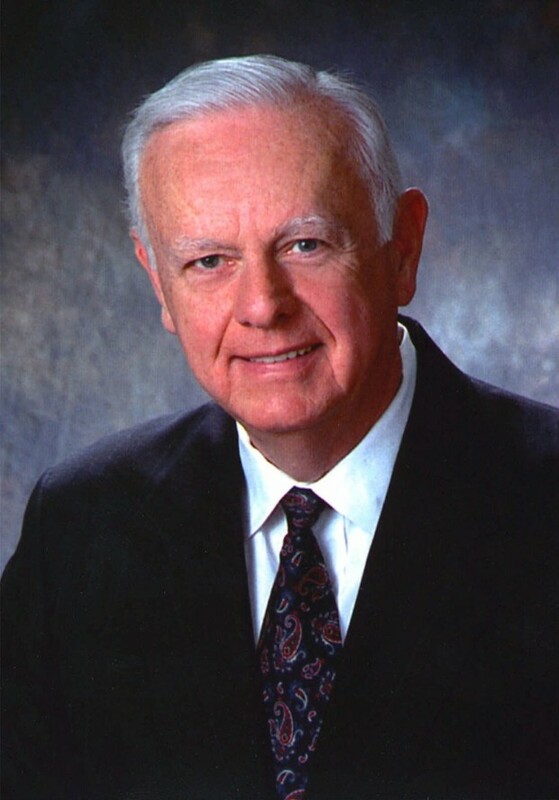 He established a law practice, served in World War I, then returned to practicing law. After serving in the Senate, Duffy was appointed federal judge for the Eastern District of Wisconsin in June 1939. He was named an appeals court judge in the U.S. Court of Appeals (Seventh Circuit) in 1949. Duffy died on August 16, 1979. It was mixed in with photographs and other documents — a colorful, torn ticket stub. I picked it up and examined it and was left wondering, what is the story behind it? 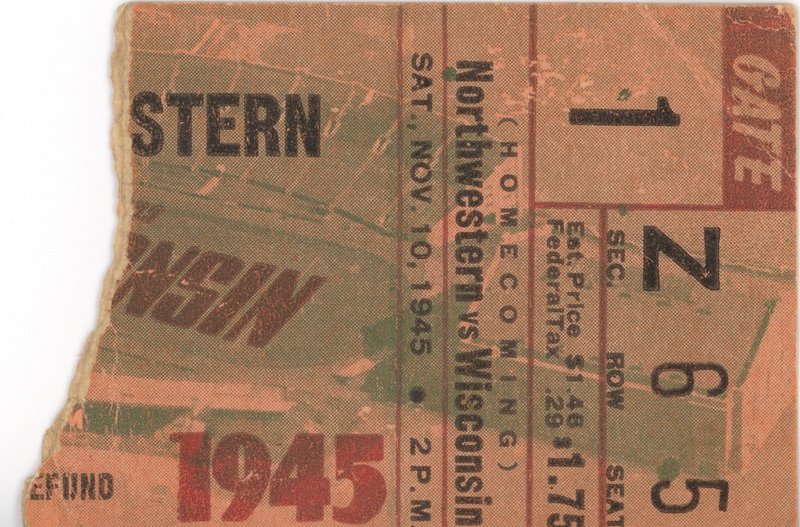 The game was between the University of Wisconsin and Northwestern on November 10, 1945. I presumed that my Dad was the lucky holder of the $1.75 ticket. He was 12 at the time, so a trip from Mauston to Madison for a college football game would have been a big treat. I had to find out more about this game. So I dug right into it. The ticket stub was like an invitation to re-live the 1945 homecoming game. The weather forecast for the homecoming game called for a high of 39 degrees after an overnight low of 18. The Friday night calm on the UW campus was broken by roving mobs of teenagers who broke store windows and vandalized cars along State Street. Madison police made 49 arrests for curfew violations, according to The Wisconsin State Journal. Still, police considered the homecoming crowd on campus well-behaved overall, so they did not use the tear gas and water wagons that were held in reserve. 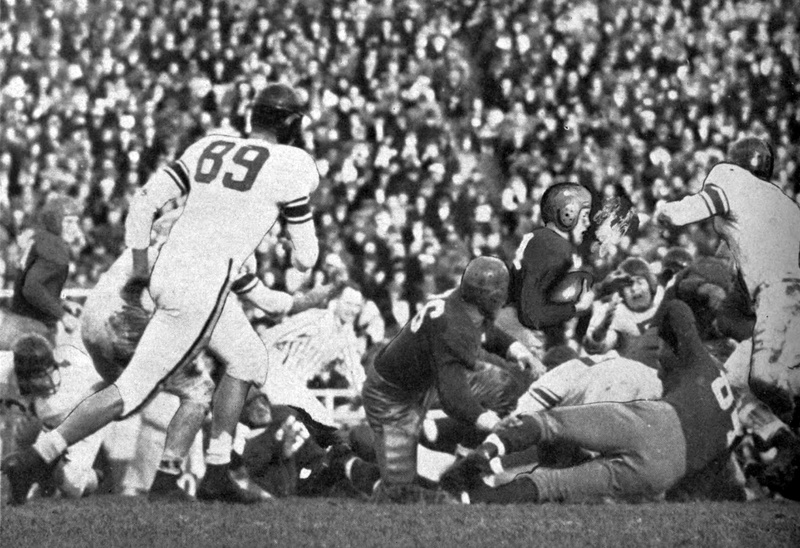 Scatback Jerry Thompson runs for 5 yards against Northwestern on November 10, 1945. Camp Randall was packed with 45,000 fans when game time arrived on Saturday. Dad (or whomever held that ticket) sat in the south end zone, Section Z, Row 6, Seat 5. This is the end of the stadium backed against the UW Field House. I’ve sat in that section myself a few times over the years. Fans were treated to a great game. “This was a game with few dull moments, one in which each turned loose a devastating running attack,” wrote Henry J. McCormick, sports editor of The Wisconsin State Journal. The first quarter ended scoreless. Wisconsin’s initial drive ended on Northwestern’s 48 when Jerry Thompson’s pass was intercepted. Northwestern fared no better, as its drive ended on Wisconsin’s 25 when Badger Don Kindt intercepted a Jim Farrar pass. ‘Big Ben’ Bendrick slashed Northwestern for 133 rushing yards, but fumbled twice. In the second quarter, Wisconsin scored a touchdown on a 16-play, 80-yard drive that ended with a reverse and a pass to the end zone. Northwestern answered with an impressive 73-yard touchdown drive. Wisconsin roared right back on the next drive. Halfback Ben Bendrick ripped off 17 of his 133 yards on one play. Kindt finished the drive by plunging into the end zone with only 8 seconds left in the half. Halftime score was 14-7 in favor of the Badgers. The second half opened with the same high tempo. Northwestern took the kickoff and moved right down the field with 70 yards on 11 plays. Farrar’s 25-yard pass to tight end Stan Gorski brought the game to a 14-14 tie. On the very next drive Wisconsin’s Bendrick tore off a 41-yard run, followed by an 11-yard scamper from Kindt. 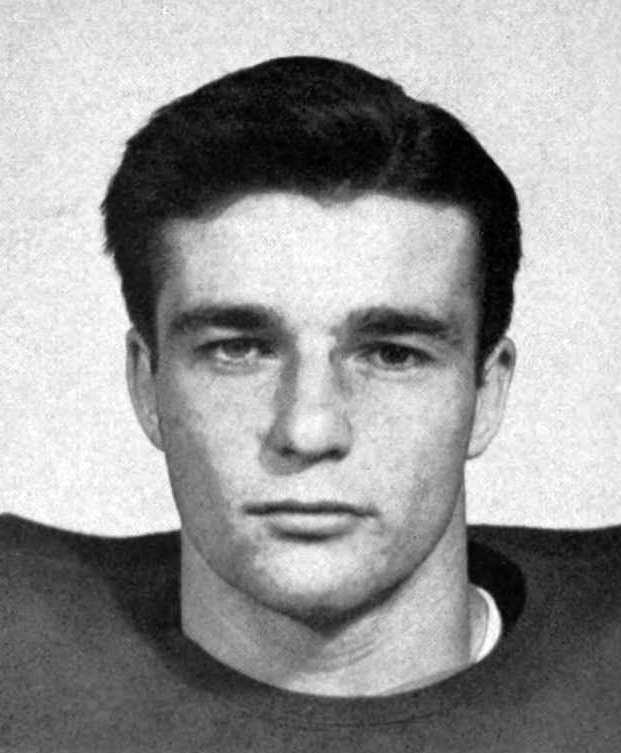 A fourth-down pass from Thompson was intercepted by Bill Hunt of Northwestern. When the Wildcats pounded down to the Wisconsin 1 yard line on the drive, the Badgers’ defense stiffened, stopping the Cats on a fourth-down pass play. As the third quarter ended, the score was still knotted at 14. On the opening drive of the fourth quarter, Bendrick continued his punishing ground game. But lightning struck as Bendrick went around left end. The ball popped out, right into the hands of Northwestern’s Hunt, who returned the ball to the Wisconsin 9 yard line. After two running plays, Northwestern took it to the end zone for a 21-14 lead. The teams then traded unsuccessful drives. Wisconsin’s Thompson threw another pick at mid-field, but Northwestern’s ensuing drive stalled. When the Badgers got the ball back, Bendrick fumbled again. Northwestern pounced on the ball at the Wisconsin 24. Seven plays later, Northwestern scored to go up 28-14. That’s how the game ended. When your team rolls up 244 yards rushing, it typically won’t lose. But on this day, the Badgers made too many mistakes, spotting the Wildcats 14 points with two fumbles. The headlines should have been about Bendrick’s stellar 133-yard rushing day. The Badger faithful left Camp Randall entertained, but unsatisfied. If my Dad, David D. Hanneman, was the ticket holder, I’m guessing he was there with his father, Carl F. Hanneman. The first Wisconsin game I can recall attending with my grandfather was a 1977 game vs. Michigan State. The Badgers lost that day, 9-7. Don Kindt ran for 63 yards against Northwestern. Hidden behind the headlines of the 1945 game was a compelling military story. It was just the third game back for Don Kindt, who shared halfback duties with “Big Ben” Bendrick. 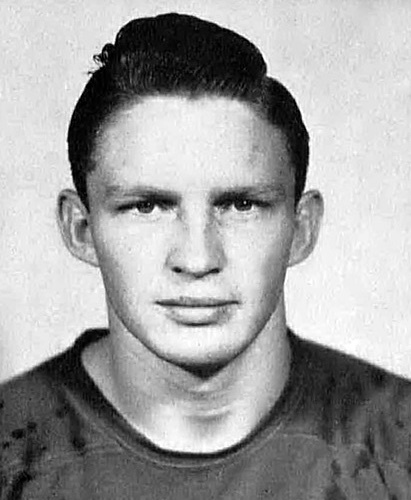 As just a 17-year-old, Kindt interrupted his Wisconsin football career in 1943 to enlist in the U.S. Army’s 10th Mountain Division during World War II. He saw extensive action in Italy and was awarded two bronze stars. He returned to the Badgers in October 1945. After his Wisconsin playing career, Kindt spent nine seasons with the Chicago Bears. He recounts his war experiences in an extensive interview conducted in 1994 by the Wisconsin Veterans Museum.